….And then suddenly, I wasn’t. I’m not sure of the exact moment when I came unstuck. It’s not surprising really. I rarely sleep more than a few hours at a time. I work from home and look after my baby. Sometimes, I can’t believe that even after fourteen months of motherhood I still haven’t crumpled into an exhausted heap onto the floor. I just keep on going, happily, most of the time. But then something happened to my momentum. It was probably a few incidents; of unravellings, like a knitted scarf with a loose stitch. You just have to pull it a little bit for it to start to fall apart. It could have been a couple of weeks ago, when I picked up my one year old from her cot, and she threw up. In my mouth. It was like a mother bird feeding a baby, in reverse. The truth is, I’ve had better meals. A few days later, I was on a work call, conducting a phone interview with a general manager for an article I was writing. Before the call, I had made a tiny wish that the same baby would sit quietly for the entirety; that the most I’d have to deal with mid-conversation were cute coos and sweet squeaks. But no. Baby, who for the first five minutes, squirmed silently on my lap, decided it was the perfect moment to unleash a furious torrent of brown liquid from her nappy. It exploded out the sides, oozed down her legs and across mine. It was on the couch. The carpet. In my hair. I was supremely impressed at my ability to maintain my composure, but I had to cut the call short. It’s not easy to preserve professionalism when you’re sitting in the middle of a raw sewage situation. For a few weeks, I struggled. I wept. I felt like I had cement in my shoes. Everything was heavy. I felt irritated at my darling baby who cried when she should have been sleeping and threw her food on the floor with all the petulance of a fully-fledged toddler. I couldn’t bring myself to reply to text messages. I felt insane, like an old gate without hinges. And yet, even then, I couldn’t help thinking about how lucky I was. You see, I have an innate positivity that’s inherent in my nature. I can’t shake it, much as I sometimes want to buy all the balloons and host a pity party for one. I have too much to be grateful for. A brilliant husband. A beautiful, funny, flame-haired baby. 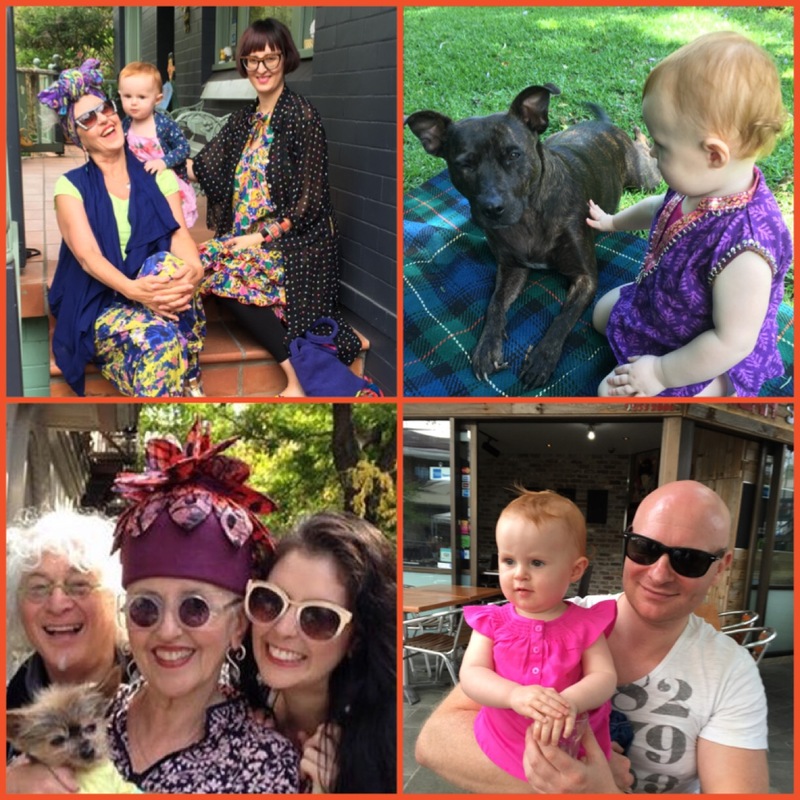 A colourful, creative, entirely lovable family. A sweet little doggy. More friends than I ever could have imagined. A roof over my head. Sunshine. Safety. Beauty. Any time I’ve ever undergone any sort of adversity, I’ve reminded myself that no matter how crummy my day is, there’s always an antidote. Brilliant, brilliant. OOOOOze or no ooooze you are such a great writer, and I so enjoy your sharing your journey. Ohhhhhh, Cecily, I can so relate. I have 2 boys, 13 months apart (the second on born on Thanksgiving). I remember a friend coming to my door which I answered with a giant safety pin holding my ratty together. I was upset looking at Southern Living magazine because my life wasn’t like that! I saw this comment before I saw your first one, and I spent a good five minutes looking at it trying to figure out what Ratty robe meant. Ha ha ha. Cecily. You are such a great and funny writer that I spent one night this week reading a whole string of your blogs and didn’t get to bed before three in the morning! Of course, it doesn’t hurt that I’m “crazy in love” with your whole family, so I can really relate and grin idiotically as I’m picturing everything that you’ve experienced! Thanx for giving me many laughs! !